Situated in the heart of Orange County, the Hilton Anaheim hotel puts families in a prime position for enjoying the many attractions and entertaining activities of Disneyland and beyond. The great facilities, comfortable and modern rooms, and family-friendly pool area with hot tubs and kids Splash Zone make this is great base where you can enjoy some quality time together. The property provides a health club, with indoor pool and wellness facilities, as well a farm-to-table inspired restaurant and bar, serving up a selection of tasty dishes that make the most of sustainable ingredients. Hilton Anaheim is surrounded by a host of great attractions, from beaches to golf courses and sports stadiums, ensuring that there’s plenty for all ages to make the most of. The Hilton Anaheim is situated next to the Anaheim Convention Centre, just one block from the famous Disneyland Resort. The parks and attractions at this world-renowned resort are all within easy reach, making it a great choice for families, as well as Newport Beach, golf courses and the Angel Stadium close by too. The hotel provides 1572 guestrooms and 93 suites. The hotel provides a children’s menu in the restaurant and a play area in the outdoor pool; cots and high chairs are also available upon request. The largest Marriott all-suite, full-service hotel, located just a mile from Disneyland Resort and the Anaheim Convention Center. 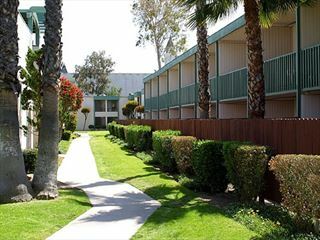 The Wyndham Garden Anaheim is conveniently located one block south of the Disneyland Park, making it an ideal choice for families looking for a comfortable and convenient hotel.